The Bowdoin Marine Science Semester (BMSS) is a Fall semester immersion experience in marine field work, lab work, and independent research. Join BMSS alums, faculty and staff to find out more about this opportunity. The semester is available to Bowdoin students and non-Bowdoin students who are enrolled in colleges that participate in the 12-College Exchange Program. We welcome students from all disciplines who are keen to experience marine science in action. Prerequisites for the program are: the Introductory Biology Sequence- either Bio 1101 and Bio 1102, or Bio 1109 and a math course above 1000. Students take four courses sequentially in three-to-four week modules taught at the Bowdoin Marine Laboratory and Schiller Coastal Studies Center in Harpswell, Maine. The module style allows for continuity of laboratory and field research. Students take four courses sequentially in three-to-four week modules taught at the Bowdoin Marine Laboratory and Coastal Studies Center in Harpswell, Maine. The module style allows for continuity of laboratory and field research. Hands on field work and cutting edge laboratory science are a central component of the BMSS. 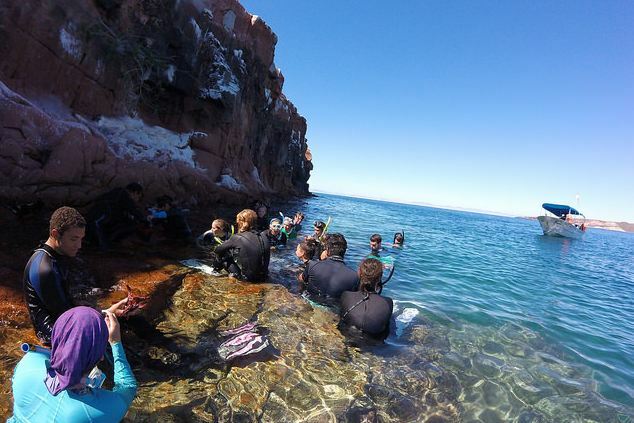 The Benthic Ecology course includes a 10 day field seminar to the Gulf of California, Baja California Sur to study the natural history and unique ecological properties of this highly productive and exceptionally diverse tropical marine ecosystem. 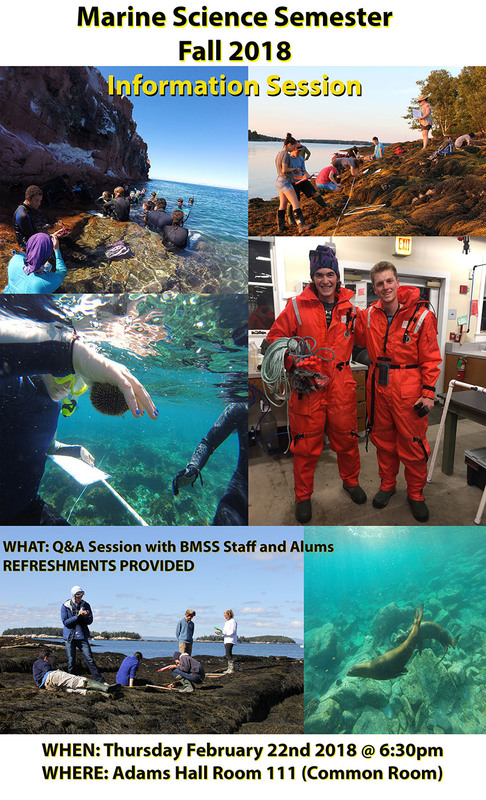 In the Gulf of Maine ecosystem, BMSS visits Hurricane Island, off Rockland, Maine, and Bowdoin’s Kent Island in the Bay of Fundy, New Brunswick, Canada. In both locations collection and curation of a long-term dataset to access changes in the intertidal community as climate changes in the Gulf of Maine has begun. Several cruises collect physical data and phytoplankton for the Biological Oceanography module, and the Marine Molecular Ecology and Evolution module, which also features a student driven population genomics study focusing on intertidal snails, and utilizing next generation sequencing technology. For the Fall of 20017 Marine Semester interested students will need to submit a short 1-2 page essay explaining why they want to enroll in the Marine Semester. Please also include any research experience you may have had in the past. The program is open to sophomores, juniors, and seniors from Bowdoin and colleges participating in the Twelve College Exchange (Amherst, Connecticut, Dartmouth, Mount Holyoke, Smith, Trinity, Vassar, Wellesley, Wheaton, Wesleyan, and Williams College-Mystic Seaport Maritime Studies Program (and Bowdoin). Students from Twelve College Exchange schools should apply through the Twelve College Exchange application process for study at Bowdoin, indicating the Bowdoin Marine Science Semester under ‘courses’ and ‘intentions’. Pre-requisite: Two of either Bio 1102 or Bio 1109 and Math 1000 or higher. See the webpage for more information. 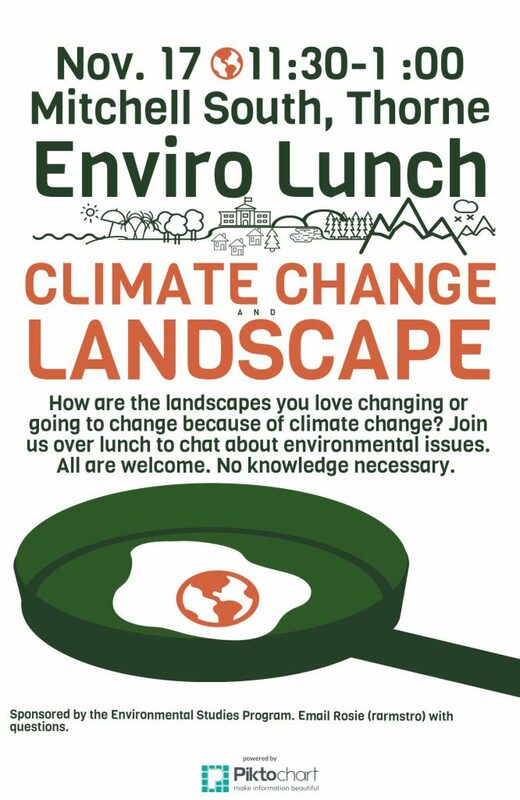 Contact Steve Allen (sallen@bowdoin.edu) or Rosie Armstrong (rarmstro@bowdoin.edu) with questions.